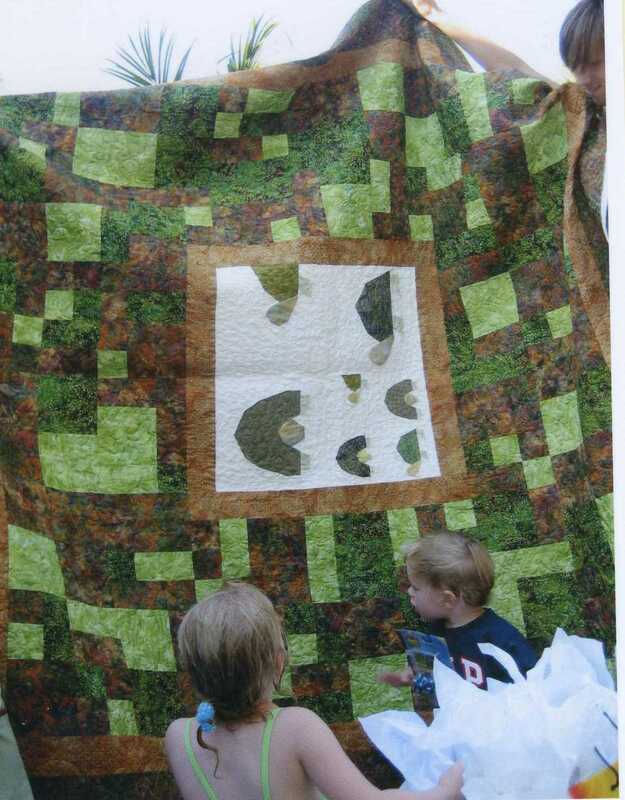 July 2006, I can't believe it's been that long since I made this quilt. But as tradition goes, I make a quilt for each of my grandchildren for their second birthday. I try to make it of a design that reflects what they are interested in at the time. Toring was fascinated with the turtles that his dad keeps and that we also have. Our turtle was a great source of fun for him to watch and feed, so I used a bunch of green and brown batiks (yes, I went through a batik phase, ugh) and paper pieced some turtles for the center. This quilt is huge. It covers a king sized bed. Five years later, I see this quilt at soccer games and in use at the beach too. I am so glad to see that the quilt is being used and not left folded in a lonely linen closet somewhere. Can't believe this boy is already 7 years old! They grow too fast! Really extraordinary. This must have taken a lot of hours!!!! Your family is LUCKY to have you!! So cute Di and must be great to see it still being used...! I love turtles and I think that your quilt is awesome! I'm just starting to make quilts, but I dearly hope that I still see them being used many years down the road. That centre panel of turtles is so awesome! Wonderful quilt. I think it's quite hard to come up with a good idea and good fabric for a boys quilt. I'm not keen of batiks either, but it just the right thing here. With all the love and hours that went into it, it would be a shame to be stuffed in a closet! Hope he wears it out until it's nothing but threads. He'll always remember the comfort it gave him! What a great tradition and such a fun quilt for a boy! I love turtles. The quilt is great and it is so nice to see these quilts used so often. I love that!